The BLINDER is easy to mount and easily serviced. The built-in self-test function guarantees reliable and complete protection anytime you need it. 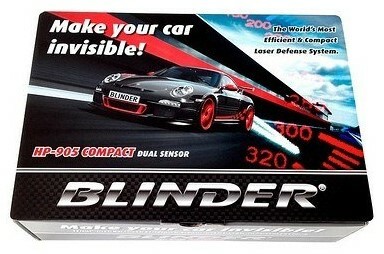 The two BLINDER laser-jammers units melt aesthetically into the cars front. They are small, hardly show's, but they do their job better than any other shows. The Blinder's infrared pulses are arguably the strongest available anywhere for non-military product technology. You get a laser-jamming shield in front of the car that prevents all possibilities to measure the car's speed. You're protected by an electronic 'laser shield' in front of you. Blinder's infrared pulses are unarguably the strongest available anywhere for nonmilitary product technology. You get a laser jamming shield in front of the car that prevents all possibilities to measure the car's speed. When the ignition is turned on, the upstart self-test function (STF) will tell you that the BLINDER is ready. BLINDER is on standby until a police laser gun hits the car. Now the BLINDER starts to do is job. The laser warning system (LWS) tells the driver, that a laser gun is operating near him. He may want to slow down. The IR Detection transmit the incoming police laser pulse frequency to the computer. The correct jamming pulse (APS) is selected. Because the jamming pulse is transmitted only for a fraction of a second, it has become possible to apply an extremely powerful return jamming pulse signal. The police laser gun or photo trap cannot measure the speed, and driver can continue without a speeding ticket. Updated version of the Blinder M20 with upgraded internals for laser jamming performance, reduced noise alerts and detection of all laser guns used today around the world. New Feature: A new laser detector with wider and improved detection of all police laser guns. New Feature: Custom jamming LEDs "for Blinder products only" to give improved jamming output from the new high powered, infrared LEDs.